Heat 2 tbsp vegetable oil in a large pan and add a chopped onion. Fry until soft, then add a sliced red pepper and a chopped clove of garlic. Add a drained 410g can chickpeas, a handful of broccoli florets and 100g green beans. Cover and simmer for 5-10 minutes, until the rice and veg are tender. 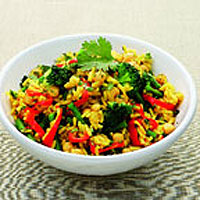 Season, add plenty of chopped coriander and a good squeeze of lemon juice, and serve.